(Photo courtesy of K.R. Mele) Pastor K.R. 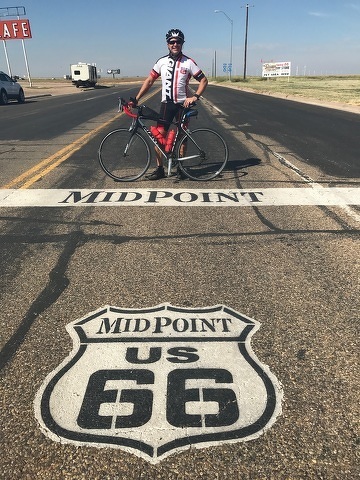 Mele stopped at the midpoint of Route 66 near Adrian, Texas, on his 2,500-mile bicycling mission trip. In April 2014, Pastor K.R. Mele and his friend Harold Morgan pedaled their bicycles for 3,178 miles on a combination fundraising and mission trip from Santa Monica, Calif., to St. Augustine, Fla. On Sept. 6 of this year, the pastor and a diverse team of 15 people took off on another cycling odyssey, this time following historic U.S. Route 66 from Chicago to Santa Monica. The trip, called Mission 66, took the riders through seven states, covering nearly 2,500 miles and taking 32 days to complete. Mele, the pastor of Family Life of Penns Valley church, described the trip as a mission trip, designed to spread the Christian gospel to as many people as possible. Mele said the group stopped at five churches along the route, and he preached sermons at three of them. They met many interesting people on the trip, including one of only 13 remaining Navajo code talkers from World War II. A camper stocked with food and supplies followed the group, who also slept it in at campgrounds along the route. Mele said the group had several flat tires on the ride, which were replaced with tires and tubes donated by Earl’s Bicycle Store in Lewisburg. Mele credits his team of riders for the accomplishments of the trip. “We had a great team, and what was accomplished wouldn’t have been able to be done without a great team of people,” he said. He feels that spreading the gospel was the most important part of his trip. Penn State wrestling made short work of Bucknell Sunday afternoon and ran its dual winning streak to 33 with a 36-6 win over the Bison. 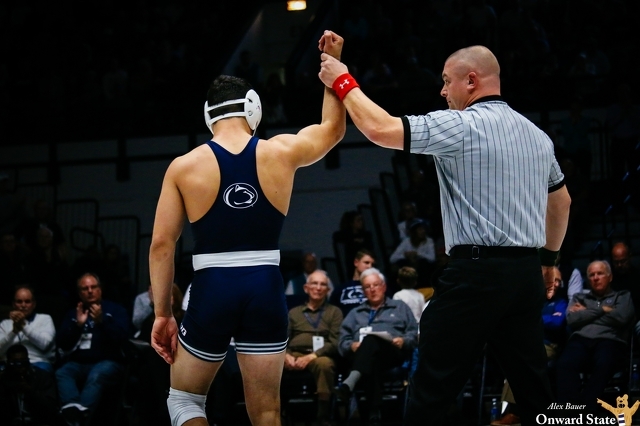 After trailing 3-0, the Nittany Lions won eight of the last nine bouts, including two pins and two tech falls. In a dual where the Bison only sent four of their listed starters onto the mat, Penn State recorded 46 takedowns compared to Bucknell’s five.